The NMBM would like to implement a new sustainable programme to allow approved service providers (investors) to approach citizens to finance, install and maintain PV systems on their roofs free of charge for the next 20 years. These investors will be reimbursed through the electricity they produce with the installed PV system. The details to this programme will be available to the public for comments on this website and also as download for the following 60 days, starting from 13.01.2018. Please note that there could be made small changes in the document during the publishing period! Installations will initially be limited to rooftop PV and structures which fulfil a second purpose besides energy production. Freestanding installations will not be allowed. Participating customers will have to be connected to the NMBM electrical network. The proposed program is based on NERSA’s approval in terms of the connection of embedded generators within municipal boundaries provided that such generation systems are 1MW or smaller. The contract period with the participating customer per installation is 20 years. The average installed capacity of all participating customers (from each investor) must be =5kW per participating customer. For example investor x signed up 3 prosumer. No.1 got a 2KW system, no.2 a 3KW system and no.3 a 10KW system. In average the investor got a 5KW system per prosumer installed. The amount of produced kWh/a from the PV system per participating customer must be half of the yearly electricity consumption of this participating customer, whereby it is allowed to install the necessary capacity at a different participating customer to meet this requirement. The amount of produced kWh/a from the PV system per participating customer must not exceed twice the yearly electricity consumption of this participating customer. The investor is allowed to wheel the electricity between the participating customers, whereby the produced electricity shouldn’t exceed the overall electricity consumption of all participating customers, since the municipality will not buy excess energy. Third party arrangements with licensed power traders will be allowed, to sell excess energy. 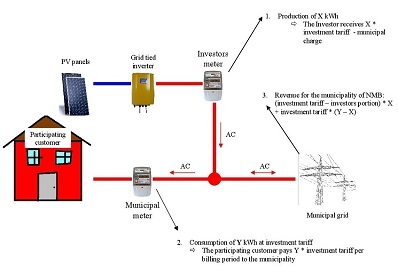 Lost yield due to grid faults or maintenance will not be compensated by the municipality. The NMBM will not be signing a Power Purchase Agreement (PPA) with the IPP, but will only facilitate the flow of money between the IPP and the participating customer (i.e. the NMBM will invoice, and collect the money from the participating customers on behalf of the IPP). The payment to the investor will be on the usual payment conditions of the municipality (which is normally within 30 days). It will be the responsibility of the IPP to enter into the necessary agreements with – the participating customer. How do I as a citizen benefit from this programme? If you sign up for this programme you will be registered on a new tariff, the so called "investment tariff". This tariff is in many cases cheaper than the existing tariff and will increase over the next 20 years only by 80% of the previous tariff the customer was on. How does the municipality benefit from this programme? The municipality will receive from each kWh produced by the PV system a portion to cover their cost on grid maintenance and running this programme. Anyone who fulfils the criteria in the rules and regulations as an investor. The document can be downloaded here. Potential investors have to hand in the required documentation and be approved by the municipality, before being allowed to approach customers. How can I give feedback on the proposed PV programme of the municipality?